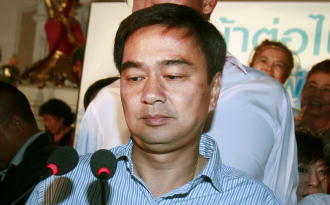 Asia Provocateur: UPDATE - Abhisit rumour: Willing to be a coup Prime Minister? UPDATE - Abhisit rumour: Willing to be a coup Prime Minister? UPDATE: A couple of nights back on 10th May Thai Army tanks were roaming the streets of Bangkok on unannounced manoeuvres, something which spooked the government and more of the Thai press, including the national paper, Matichon. Whether these coup rumours go anywhere remains to be seen but the Thai Army is certainly sabre-rattling. UPDATE: A few days back at start of May 2013, Thailand's biggest selling and most important national newspaper, Thai Rath, reported a group of Thai Army generals had held a suspicious meeting. According to Thai Rath, the security networks close to the present democratically elected Pheu Thai government took this as a warning that a coup might be on the cards. Obviously in the world of rumours, smoke and mirrors that circulate around Bangkok the recent coup rumour is hard to substantiate but the fact Thai Rath reported it is significant. A rumour is circulating in Bangkok that Thai Democrat Party leader Abhisit Vejjajiva has made it very clear he would be willing to be installed as Prime Minister again if a military coup was used to topple the present, democratically elected Pheu Thai government of Yingluck Shinawatra. Abhisit was Thai PM from 2008 to 2011 but hasn't won any of the three elections he has led his party into and leads a party that hasn't even been the largest in the Thai Parliament since 1992. Whilst unsubstantiated the rumour that Abhisit would be willing to be a "coup PM" has some foundation given Abhisit's route to power in 2008 which involved support from the neo-fascist PAD, the army and a political party which was conjured out of thin air in order to give Abhisit a large enough "coalition" to take the PM seat. Abhisit then clung to power for 30months using 10s of 1000s of troops to crush pro-democracy protests in 2009 and 2010 which called for fresh elections to test Abhisit's mandate (his Democrat Party was crushed in the 2011 election). Almost 100 civilians died and 1000s were injured as a result and Abhisit has recently been charged with murder. Given his record it's pretty clear Abhisit is a Democrat who doesn't believe in democracy. So the question remains: would he be willing to be a Coup Prime Minister? I have written to a member of the team of a senior Democrat Party asking them if they wish to respond to this post. I will publish their response here should they make one.